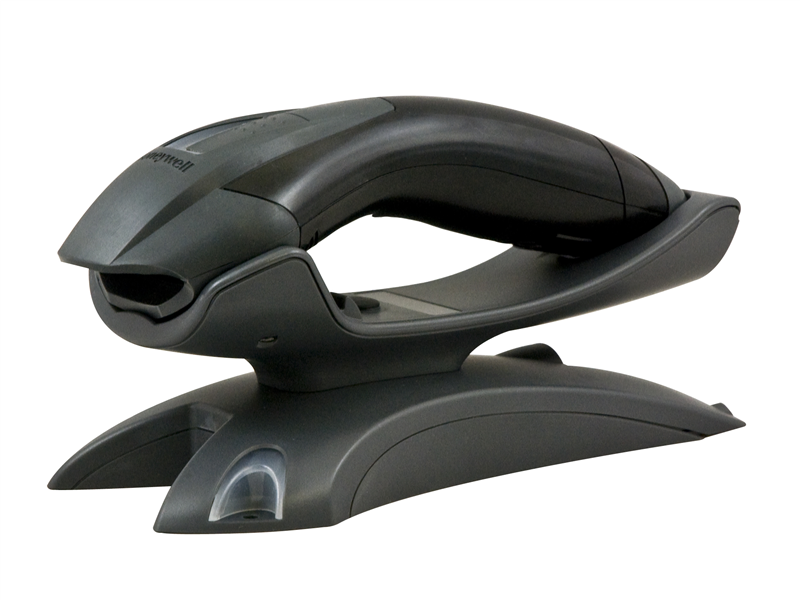 The Honeywell Voyager 1202g Barcode Scanner delivers aggressive barcode scanning with Bluetooth freedom, fantastic for retailers needing more flexibility with their scanner. An extension of the Voyager 1200g platform, the Voyager 1202g offers 33-foot radio range, adding mobility to the Voyager's already impressive toolset. And if you happen to misplace the scanner, a pager button on the cradle makes locating the Voyager 1202g a snap. Honeywell built the Voyager 1202g with long lasting Lithium Ion battery, giving you 12 hours of scanning time and 45,000 scans per charge. The battery is field-replaceable, easily swapped out without needing tools to access the battery compartment. Charging time is about 4 hours, minimizing downtime between scanning sessions. Scanning 1D barcodes is a snap with the Voyager 1202g. An optimal scan range of contact to about a foot for standard UPC barcodes ensures fast reads and eliminates searching for the scanner's "sweet spot." The Voyager 1202g can also read scratched, faded, damaged, or generally unreadable barcodes with ease. The day-to-day rigors of retail use are no match for the Voyager 1202g's durable body. The rubberized hood on the barcode scanner protects it from accidental bumps, and the rugged body can withstand 30 5-foot drops to concrete. Honeywell designed the Voyager 1202g with an IP42 seal, keeping internal components safe from dirt and random splashes of water. 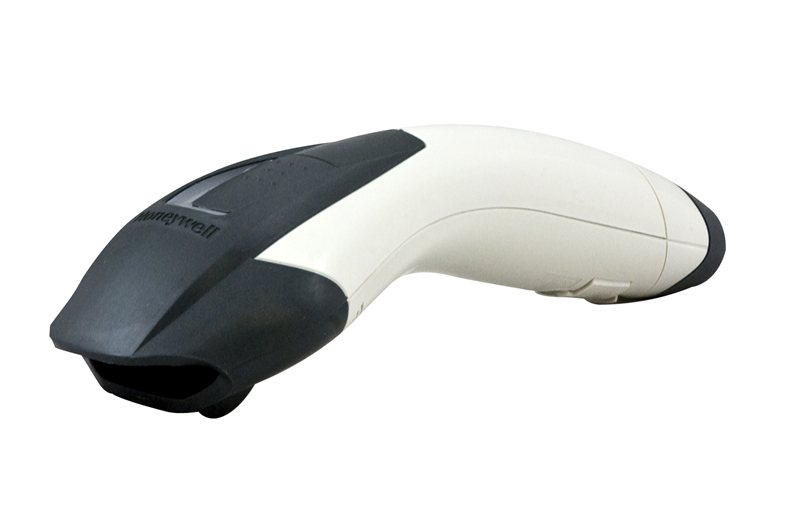 With a 3-year warranty and additional Service Made Simple comprehensive coverage plans, the Honeywell Voyager 1202g barcode scanner is a rock-solid cordless solution for any retailer. 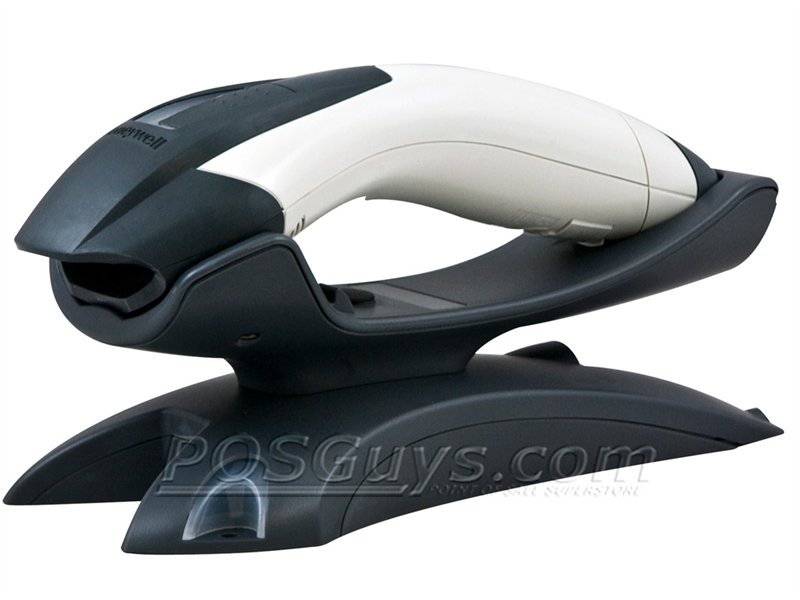 Dimensions Scanner: 7.1" x 2.6" x 3.6"
Charge/Comm Base: 7.9" x 2.6" x 3.8"
The Voyager 1202g is a great cordless scanner, adding freedom of mobility to the already amazing Voyager barcode scanner line. Although the Bluetooth radio is rated to 33 feet, tests have shown it to maintain signal up to 300 feet away, line of sight. Find it faster! Click here to compare Voyager 1202g models by feature. Hi this is Travis from POSGuys.com. 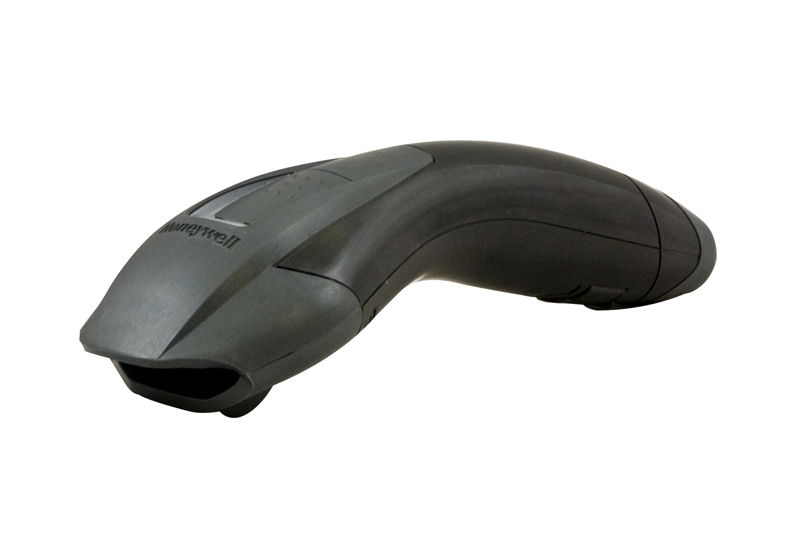 Today we're going to take a look at a barcode scanner, the 1202g Bluetooth Barcode scanner by Honeywell. 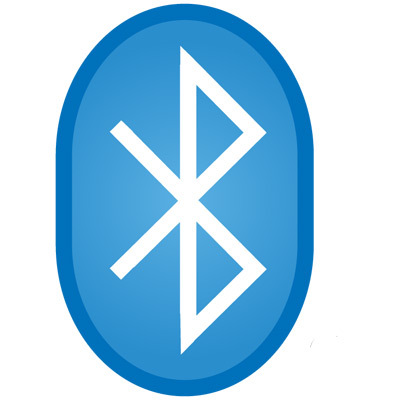 This is the Bluetooth version of one of their most popular barcode scanners the Honeywell Voyager. Traditionally you'll see it in a hands free type of mode where it is sitting in a stand. This is a Bluetooth version for those that like the capabilities of the Voyager but need to go without a cable. There are two main versions of it. The regular 1202g that uses a battery and the 1202g-bf which is a battery-free. Instead of a battery it uses a super capacitor. All that means is that instead of a traditional battery the capacitor has the ability to charge very quickly but it also holds less of a charge. So you'll need to be in the stand more often but when you do need a quick charge it is very quick, we're talking like a minute and a half and it will go from completely discharged to fully charged. 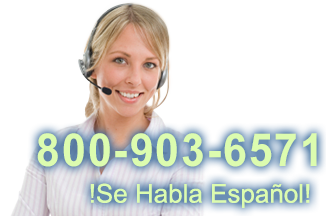 You would be limited in our testing to about 70 scans and that is assuming rapid scanning. If you're going to do a scan, walk away from the scanner, leave it off the stand, come back scan another thing you will get far less scans so it is important to return it to the charger but if it is completely discharged it does charge fast. So think about your operations and that is the type of scanner you would want to go with. Your Voyager is going to have pretty good 1D scanning capabilities with a standard UPC code you can get anywhere from almost contact out to about a foot. You're going to have to play with it. It depends on the quality of the barcode and how reflective the barcode is but at best on a standard UPC you are looking at about a foot to about eight inches. With the bigger barcodes you'll have more range. Can go a little further away and with a 1D laser you need to be lined up fairly perpendicular with the lines. Going off center you won't be able to get a read. In a bright light condition like outdoors or under spotlights of sorts you're going to have difficulty getting a read but with the spotlight pulled back you can start getting a read but it is pretty difficult. As soon as you put it back in the bright light it is not going to be easy to read you are going to have to pull it back quite a bit. So obviously not ideal for a bright light condition. The charging cradle on the scanner is pretty straightforward. It is a drop in cradle so you just set it in and it charges. You have indicator lights. When it blinks that means it is charging. When it is fully solid green that means it is fully charged. The read light means that the base has power. There is a paging functionality should you misplace the scanner. Press the paging button and your scanner will beep. By activating the trigger it will stop the beeping. There is also a little hook for a wall mounting scanner. This piece pulls down. Once that is pulled down like that then the scanner can drop in and it can be charged vertically if you want to do it like that. The charge, the communication cable for the scanner plugs into the back, it is replaceable, you can use USB today and if you want to change to a new USB cable in the future or if a new technology comes out if you want to go to like a Serial connection you can order a serial cable. 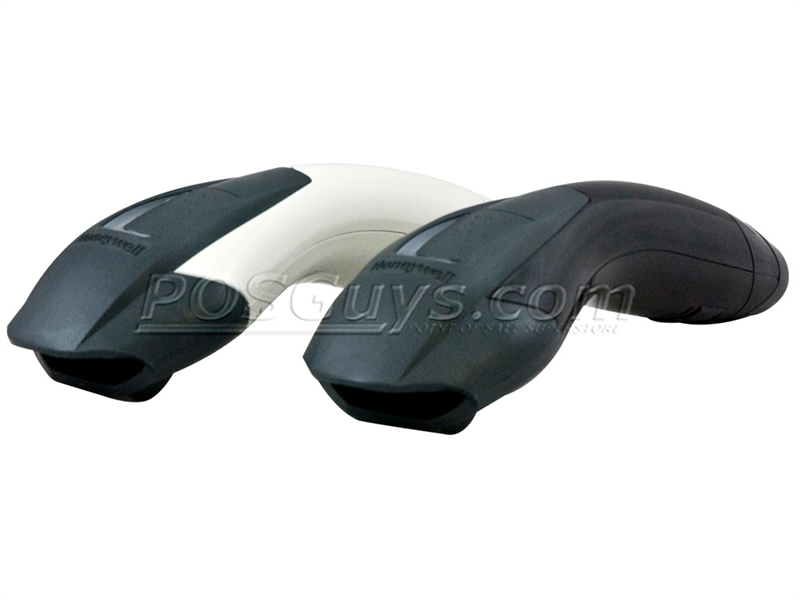 The scanner also features toolless replacement of the batteries. The battery free version you can't do this the ability is locked out. On the batteried version you lift this tab up. This piece pops out and the battery slides out so if you want to stock a couple different batteries and switch them out between shifts you can do that. Just slides back in, snaps back down and then your scanner is good to go. This is the Honeywell Voyager 1202g and 1202g battery free. They are both good 1D retail scanners definitely you should consider if you want a companion scanner to a handsfree type of scanner. Three year warranty on this unit. It also has a five foot drop spec so if it rolls off your counter and falls on the ground you are probably going to be okay it is rated at 30 drops at five feet which isn't bad for a Bluetooth laser scanner. For more information on either the Voyager 1202g or the Voyager 1202g-bf please visit our website on POSGuys.com. Thanks!